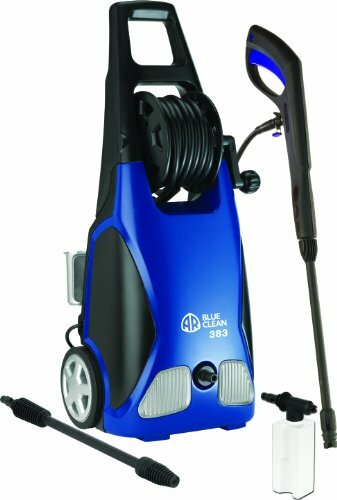 At first glance the AR Blue Clean AR383 might strike you as a vacuum cleaner, well at least that’s what I thought. Plastic casing, copper and aluminum components with a complete kit of accessories such as lance, hose, jet nozzle, gun and foam dispenser all give it a more than commercial feel. Plus you have a trolley design with wheel mounting for easy handling and a reel system to secure the hose. As for safety this model features an auto safety shut-off valve directly at the pump head called the Total Stop System. It also comes with attachable foamer and a soap bottle. Rated at 1900 PSI and 1.5 GPM, it uses an 11 Amp induction motor and a 3 axial position pump. As far as usability goes, this is quite easy to get your hands set with. From the moment you power the unit to the time it dies down after use, you never once feel underpowered or out of control. Moving it around, assembling it right out of the box and securing the hose, changing connections all seem quite easy. The only problem though lies in the hard plastic material used for the hose. This makes it rather difficult to reel it back in as it tends to coil up on itself. What I do now is to leave the hose as it is, wrap it around the handle manually and disconnect it from the hose adapter port. Another nagging issue you might face on uneven terrain is stability. 11 Amp motor delivers impressive power but without the associated noise. In fact, this baby is super quite even when using the high pressure spray tip. It is so silent that you can use it in the middle of the night and never once feel worried about waking the neighbors up. Had the AR383 been a gas mower, I would have rated it as a 3.5 out of 5 pressure washer. However, being an electric washer, 1900 PSI at 1.5 GPM is a lot of force to reckon with. For a commercial or semi-pro electric pressure washer this is a lot of power built into a compact frame. A good pump design and sturdy construction also plays a major role here. pressure output, you really won’t have to bother extending its length. One particular reason why the AR Blue Clean AR383 wins over other electric pressure washers is durability. Unlike the other models and makes I have tried out, this one actually seems to be constructed from high quality components. The only problem in my view as far as durability goes is the hose adapter that tends to sprout a leak at times. I got over this issue by purchasing a high quality copper adapter to replace the plastic one given by AR Blue Clean. Hence, the missing one star. After all, they could have taken the pain to ensure this tiny component was made from metal rather than plastic. AR Blue Clean is actually quite reliable in terms of customer support. I read in many reviews that their customer support department is prompt to answer queries, take requests and process replacement components. Unfortunately, I haven’t yet damaged anything on this particular model and this being my first AR Blue Clean pressure washer, I really cannot comment personally on their support. But, I haven’t yet read anything bad on their service. 1.5 GPM and 1,900 PSI rating. Triplex 3 Axial-piston based pump design. 30 feet power cord and 20 feet hose. Hose reel helps keep hose clear of the way with a hand crank. 1900 PSI ample power and easy usability. Plenty of attachments with versatility in usage. Lightweight design, easy maneuverability. The hose is irritating as it takes some time to unwind, it can tangle easily and is kind of stiff. The washers for the hose adapter too are flimsy. On the whole, the AR Blue Clean AR383 seems like an awesome machine to me. It may not be the best in the market but considering the price it retails at, its reliability and durability, it is definitely something worth having around in your home. For any homesteader, a long lasting power tool is always the best thing. This pressure washer is ideal for folks who are interested in home maintenance chores. In fact, it can take care of just about anything around the house.